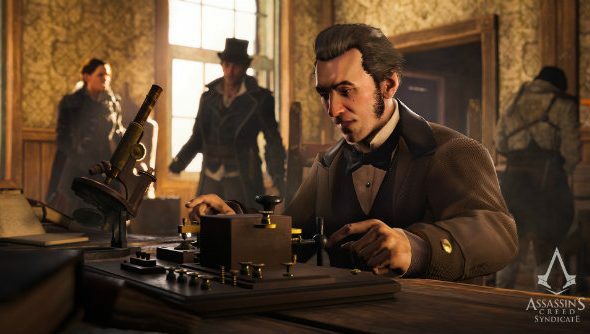 It’s just over a month until Assassin’s Creed Syndicate lands on PC, and the trailers keep coming like a steam-powered, Victorian-era train. Did you know Jeremy Irons and Brendan Gleeson have been cast in the Fassbender Assassin’s Creed movie? The latest trailer focuses on the famous historical figures that will become your allies across the course of the story. The first is Alexander Graham Bell, one of the people accredited with the invention of the telephone. He also made electric grenades, apparently. Typical Bell. Next up is Karl Marx, the author of the communist manifesto. He fought for the rights of the working class, delivered rousing speeches and had a great beard. The Assassins also hung around with Charles Darwin, who is being attacked for talking about theories of evolution in a world still hanging onto creationism. Charles Dickens also has a chat with the twin protagonists at one point. He is of course famous for writing fiction riddled with political commentary. Oliver Twist, Stabby McHoodDude, that sort of thing. Assassin’s Creed Syndicatewill be available for Windows PC on November 19.